Commercial skin preparations concentrate on adding lubricating oils externally, but the aromatherapy approach is to combine such oils (avocado, almond and jojoba) with essential oils that gently stimulate the sebaceous glands to function more efficiently. Anything which improves the general health of your skin and the blood supply to its growing layers is a good thing. Dry skin is often delicate so look out for gentle flower oils such as Chamomile, Jasmine and Neroli when buying a skin product for Winter. Oils such as Geranium, Lavender and Sandalwood have a balancing effect on the production of sebum. In fact they are often used for oily skin too as they “normalise” the amount of sebum produced by the small glands beneath the skin, according to what is needed. Body oils are the most emollient, meaning they soften and nourish the skin. They also resemble our own body’s natural oils, so are easily absorbed; but if you are prone to acne I would avoid oils in those particular areas. I would however, recommend using Tea-Tree and Lavender as both these essential oils are bactericidal. Lavender is also soothing and healing and promotes the growth of healthy new skin. Ideally, body oils should be applied directly after your shower or bath on warm, damp skin. Just be careful not to slip if you do this in the shower! Regular massage with these oils will significantly increase circulation in the tiny blood vessels that feed the growing layer of the skin, and this in turn will improve its overall health. 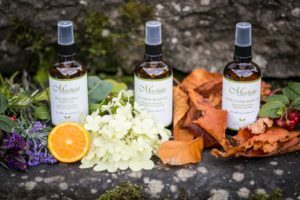 Nourishing oils made from pure plant oils and essential oils should be used regularly, especially before going out in cold, wintry weather. Our Rejuvenating Body Oil is great for keeping skin healthy and supple. It contains Sweet Almond, Jojoba and Rosehip oils for moisture and nourishment with Geranium, Lavender, Neroli and Frankincense essential oils. It smells pretty gorgeous too! Finally, don’t forget your diet; if it’s deficient in healthy fats your skin can become dry; as little as a teaspoon a day of good quality olive oil will help.